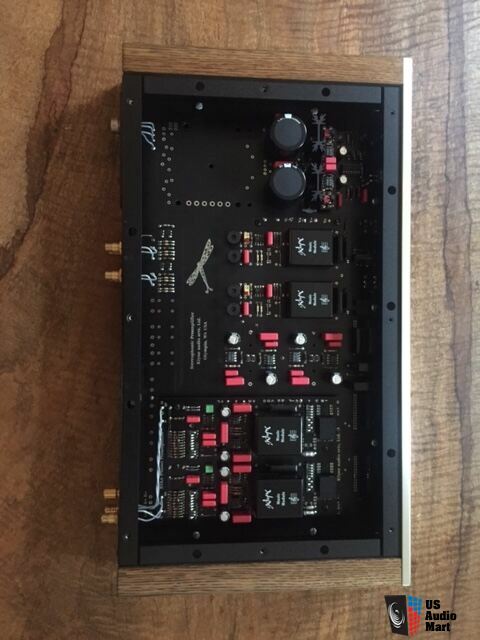 This is a very brief measurement of Klyne 7px 3.5 Phono pre-amp. It is designed locally in washington state where I live and was brought to me for measurement at our local audiophile society meeting. It originally retailed for $2,500 and I think the owner said he bought it for $1,800. So not cheap. The unit came out in early 1990s so not available anymore (company doesn't seem to be building phono pre-amps anymore). (please ignore the cursors). As we see, the noise from mains is highly dominant with the primary spike at 60 Hz just 40 dB down from our main tone. That causes a spray of harmonics that travels well into and past our main tone of 1 kHz. I think SINAD (usable signal above power of noise+distortion) was in the 35 dB range! Shocking difference, isn't it? The mains hum is now at -80 dB or a whopping 40 dB better. And importantly, it dies down by the time we get to our 1 kHz tone and we are left with just benign noise. The owner is sending the unit back to its designer to be refurbished along with my measurements. Will be interesting to see what will be addressed. On that day, I measured other phono pre-amps and with the exception of one DIY type unit running on two 9 volt batteries, the rest all fell in the same range as the unit under review here with SINADs in 35 dB range. I have to believe that some of what is heard with LP playback must include the noise and distortion from these amplifiers. Needless to say, the Klyne 7px 3.5 Phono pre-amp is far from a recommended device. I suspect little to no measurements were performed in its design. It is easily outperformed by cheaper units that cost as much as an LP or two (admittedly, the Klyne has much higher gain and compatibility with moving coil cartridges). Do you know what gain setting was used for that measurement? Was the owner aware of mains hum when listening? I owned one in the mid-80's, though maybe not the exact same model. I thought it was pretty good at the time, and it was pretty highly regarded. Unlike now, good phono stages were not that prevalent. But, things change. It and LP playback quickly diminished in my system, and even just using it as a line stage revealed its shortcomings against better stuff. I traded it in the '90's for a Levinson 38, then upgraded to a 380, then a 380S. My dealer loved me and sent me Christmas cards. I also foolishly got an Audio Research phono stage thinking I would still want to play some LP's. But, I seldom did. Phono stages can be tricky to measure, at least the single ended kind. Sometimes you have to screw around with grounding arrangements because of hum loops. It may be that the stage was this bad, but it also may be that moving some wires around could ameliorate the issue. One of the nice things about the balanced phono stages I design and build is that measurement is never an adventure. My dealer loved me and sent me Christmas cards. Phono stages can be tricky to measure, at least the single ended kind. Absolutely they can be feisty things. As we see, the noise from mains is highly dominant with the primary spike at 60 Hz just 40 dB down from our main tone. Amir, what inverse RIAA hardware network did you use on the output of the AP or are you doing inverse RIAA in the AP itself? And what source impedance were you driving the preamp and level (the phono stage has four gain settings IIRC)? We played/measured all the gain settings and it made no difference. The owner is happy with its sound so I assume the hum is not audible to him. I didn't use any since I was just testing a 1 kHz tone, not a frequency sweep. Well an RIAA inverse fed into it would drop that hum by 15 db. Still seems like a lot. My guess is the owner isn't getting that level of hum in it. Grounding on those could seem like a black art. Either the PS needs some attention due to age or probably some grounding voo doo was needed to take the measure of it properly. If the hum were part of the unit in a way that RIAA inverse wouldn't effect the result then even more so you had some grounding issues. Such a level of hum would have been obvious and bothersome to the owner if it hummed like that in his system. Well an RIAA inverse fed into it would drop that hum by 15 db. This was what I was alluding to, along with the source impedance being suitably matched to the phono front end. But I didn't feed it that hum. It generated that on its own. Since the output of the pre-amp goes directly into an amplifier, those hum contributions remain as is. They don't go through an inverse correction of any kind. Still that level of hum would not be tolerated by the owner. So I don't think it is humming at his home at that level. Yes, all of us old timers have had the experience of trying to get rid of a phono hum by connecting/disconnecting a turntable ground wire, reversing plugs, rerouting cables... Why did I go balanced? This is why. I was recently comparing the EIN specs of some microphone pre's. My simplistic approach was to adapt TRS cables to XLR, and short across the T and R rings with a 200 ohm metal film resistor. But we're talking 60 db of gain onto that. And hum was a problem. Even with good isolation at the very low noise levels I was attempting there was measurable hum pickup. So taking a page from phono hum mitigation experiences, I tore off a narrow strip of aluminum foil, wrapped it around the S or ground part of the connector. I had already put a bit of newsprint around the rest of the lead to prevent shorting, and wrapped this strip loosely around the resistor/newsprint. All evidence of hum vanished below the very low noise floor. I've seen otherwise good phono pre's that I needed to put a layer of foil beneath and ground it to the chassis to prevent hum. Or put such a piece between the phono pre on one side between another piece of gear and the difference was nice no hum quiet or bad hum. Or sometimes ground those strips instead to the third pin of the power plug. Or as SIY mentioned flip the power cord with a cheater plug. With that kind of gain at low signal levels you just never know. Other than if it hums, do something. Keep doing something until the hum goes away. But I didn't feed it that hum. It generated that on its own. Since the output of the pre-amp goes directly into an amplifier, those hum contributions remain as is. I understand, but phono stages are special beasts. Often very high impedances (FET inputs) and as you know, enormous gains. Just the placement and quality of your cabling to the AP could be the issue. The capacitance of that cable itself, the source impedance and shielding quality. Phono stages are typically tested for residual noise with a shorted input- did you do that? Then your S/N can be measured with respect to maximum/rated output and/or rated THD. Phono stages are typically tested for residual noise with a shorted input- did you do that? That will cause the measurement to miss current noise, especially with MM stages. OK, line inputs were always shorted for S/N, I can't be sure phono was too. The standard was IHF A '78 IIRC usually with respect to 2.5mV or perhaps 5mV. But it can't be floating or some source impedance not in the MM or MC ballpark. For MM, I use a cartridge body, something with roughly 1k ohm and 1 Henry. MC is easier, just a resistor (10-15R). Just the placement and quality of your cabling to the AP could be the issue. Very true, I've never had a TT hum problem that wasn't fixed by moving the arm cable an inch away from a power cable. I've probably been lucky. I have made VERY high-gain tube guitar amplifiers. Get the grounding/shielding of the input stage right and all of those problems don't present. It is not difficult if you know what is required.